Nowhere on the planet is cork in more bountiful supply than Portugal, where the Alentejo Region is home to the largest proliferation of cork oak trees in the world. 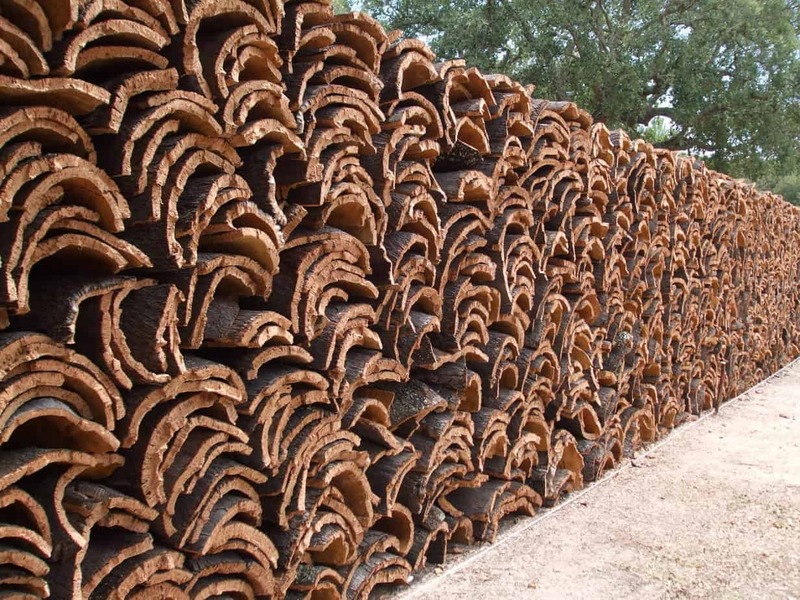 Ecologically, cork forests absorb carbon dioxide on a significant scale, assisting in reducing the impact of carbon emissions and other greenhouse gasses. Furthermore, the cultivation and management of these vast cork forests over hundreds of years has allowed a uniquely rich and varied eco-system to develop, preserving the habitats of a number of endangered species, some found only on the Iberian peninsular. In combination, stewardship of the forests and harvesting of the cork serve both to maintain the cultural and farming traditions of the region and provide opportunities for local employment in rural communities – an all-round win-win for the agri-business sector in terms of both social and economic sustainability. The harvesting of the Cork in Portugal: Hand-held axe, rare skill, brute force in searing heat – remarkable! 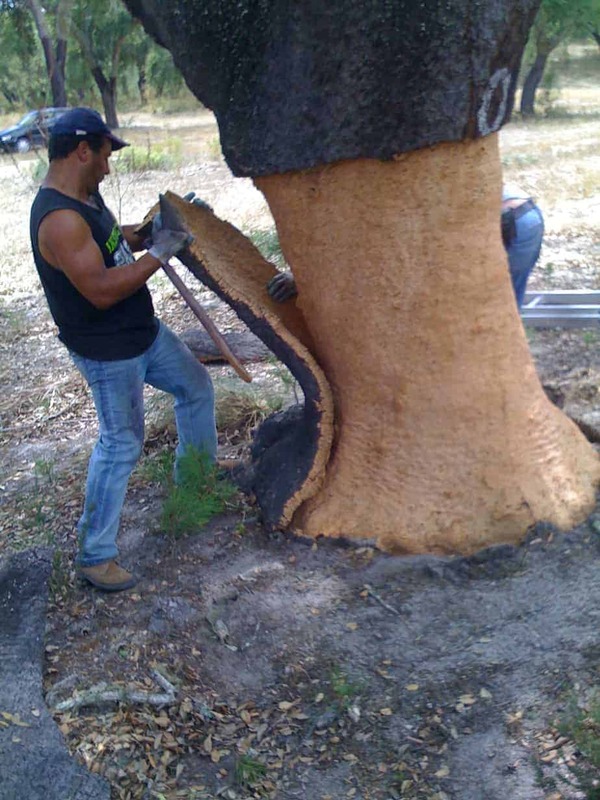 The actual harvesting of the cork really is something to see: Speed, strength and consummate skill combine on the part of the local labour employed to reveal the warm, honey-rich colour and natural beauty of the tree beneath the bark. The reveal is simply quite remarkable and completely renewable – each tree can be reharvested every 9 years. The material is a thing of Nature, a product of ecology, geography and climate. The country crowned King of Cork is undoubtedly Portugal, with some 60 million trees and 54% of all global production. Accordingly, there is no wonder that a passionate life-long specialist such as Carlos Manuel, General Manager of leading cork producer Amorim Isolamentos, is as proud and protective of the provenance of his Portuguese cork, as a vintner of his vines. Which, as it happens, brings to mind another great use for cork . . .
• In addition to strong environmental characteristics, it should boast positive attributes in terms of both social and economic sustainability. Now at this point, a hardened eco-cynic might imagine that this is simply too much to ask of an insulation product or system – after all, material of that kind doesn’t exactly grow on trees. Wrong. Actually, it does. It does quite literally grow on trees, because the material in question is cork. An organic, lightweight material with a cellular structure, cork is a natural insulator. No chemicals or additives are used in the manufacture of cork for use as an insulant and very low amounts of energy consumed by the manufacturing process. Thermally stable, fire resistant, durable and rot-proof, with relatively low embodied energy., good acoustic and airtightness properties, cork insulation is designated an A+ rating in the Green Guide to Specification, for maximum benefit in BREEAM and Code for Sustainable Homes assessments. 7. ST Silicone Render decorative finish in a range of colours and textures. Swistherm with Cork can be used extensively on both new build and remodelling projects. Cork is also suitable for use with Alumasc’s Swisslab, Swisspan and Swisrail insulated render systems. For further information on Alumasc products and systems, please click here. The Editor of sustain’, Jim McClelland, travelled to Portugal as a guest of Alumasc, whom sustain’ would very much like to thank for their warm hospitality. All flight travel was carbon offset.